Contact us for further information about our turbine optical pyrometry systems. Rotadata's Turbine Optical Pyrometry Systems provide a means of obtaining high resolution turbine blade surface temperature data within operational turbomachinery. We have developed a range of different systems suitable for various application areas and environments. Immersion depths are a key constraint in selecting the optimum system for the application. Minimum insertion systems are used where gas temperatures are high. Whilst probes with fast scanning capabilities are specified for less harsh engine conditions. For larger scan areas such as power turbines, longer probes can be traversed down the blade surface or rotated to scan platform surfaces. Optical Pyrometry provides a non-invasive technique for the measurement of turbine surface temperatures. The system operates by viewing the infrared radiation emitted by the surface and converting this, via a photo-detector, to an electrical signal that can be measured. 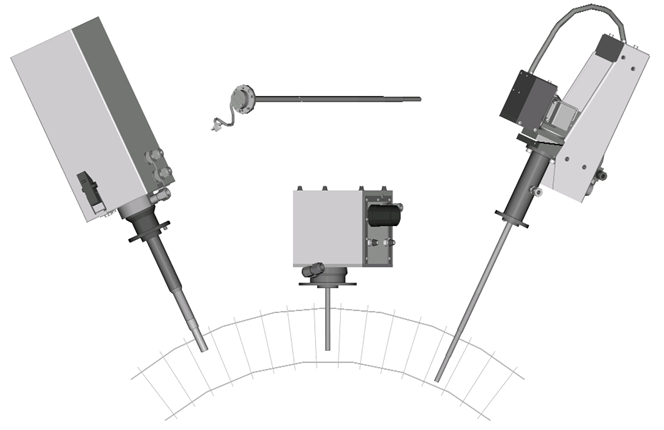 When fitted with a suitable positioning system, the area viewed by the pyrometer can be varied and when this is used to observe rotating parts, a 2-dimensional map of the surface is produced. We maintain an active development program in all the areas of the technology required in our solution and continue to enhance system performance and measurement. Look through our range of systems to learn more and get in contact to discuss your requirements further. We provide a range of product support services including technical remote and onsite support, calibration and repairs. We also support unit life cycle management including electronic module and software upgrades. Global leader in Turbine Optical Pyrometry Systems for engine development and validation. Within seconds of gathering the data, a full thermal map of the scan can be viewed. Rotadata offer a wide range of different systems suitable for various applications and environments. Rotadata supply the complete system of software, hardware and support services.